In Florida, a grim task is unwinding slowly: Finding out how many people were killed in Hurricane Michael. 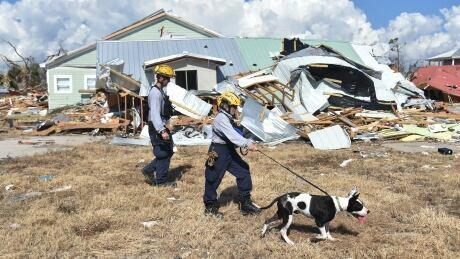 Meanwhile, search and rescue teams have crawled and walked through thousands of buildings and ruins for days in places like Mexico Beach, which was virtually wiped out when the storm roared ashore last week. The Associated Press has put the overall death toll at 17, including one death in Mexico Beach confirmed by a search and rescue team and six others confirmed by local officials in Florida. In other states, there are 10 confirmed deaths. Right after the storm hit, Brock Long, chief of the Federal Emergency Management Agency, said he expected the death toll to rise after hearing reports that some people refused to evacuate before the storm made landfall. But both Long and Gov. Rick Scott sidestepped questions late Sunday after they returned from an all-day trip to some of the hard-hit communities. Right after the storm, state officials said thousands of calls inquiring about missing people came in to authorities and non-profit groups. FEMA did announce Monday that search and rescue teams along with the U.S. Coast Guard and National Guard had rescued or assisted more than 4,000 people in storm-impacted areas and that they had checked on thousands of homes and buildings. State officials say they will announce storm-related fatalities once they are certified by local medical examiners who have gone through the steps of positively identifying those who died and performing autopsies to determine cause of death. Part of the problem, state emergency officials say, is that the medical examiner's office responsible for certifying deaths in several of the hardest-hit counties was without power or water until Monday. Last month, U.S. President Donald Trump tweeted that "3,000 people did not die" in the hurricanes that hit the island last year. He also falsely alleged that the official death toll was part of a plot by Democrats to make him look bad. Republicans in Florida, including Scott, disagreed with Trump and said they did not dispute the death toll numbers. "I've been on the phone to reporters, to fire chiefs, to heads of task force from Miami, to you name it. I've called them. I've called every hospital," Garone Behnke said Monday as she stopped to read a text from the fire chief in Mexico Beach.